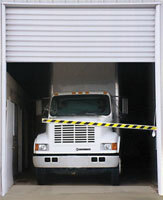 The Overhead Door Safety Guard significantly increases door safety while eliminating expensive impact repairs. This patented door protection system provides a highly visible, ANSI-approved reflective safety barrier that obstructs vehicle operators from driving through the opening until the door is completely clear. The barrier arm then automatically rises to allow normal use of the doorway.